Unless you've been completely logged out of all social networks, taking the post-Christmas week off as part of a tech detox, you have no doubt bumped into discussion of Quora, the red-hot question and answer site that has taken Silicon Valley by storm. Already an intriguing site that has seen well-respected people who do not typically participate on Q&A sites answer probing and provocative questions about their current or former businesses, the site has seen an explosion of new users, spawning an ever-growing array of discussions on practically any topic. And unlike the more mainstream Q&A sites, which have decayed into primary sources for jokes exposing the vacuousness of the below-average American, quality so far has remained strong on Quora, spawning hopes that this time, the formula is done right. The mission of Quora is a simple one, theoretically, stated as a continually improving collection of questions and answers created, edited and organized by its users. This makes it share some commonalities with Wikipedia, with the community self-policing what answers are correct or incorrect, through voting them up or down, be it due to the users' identity or the value of the answer itself. The more accurate and transparent the answer, the more likely to be accepted by the community, of course. The site has been especially interesting for Silicon Valley insiders, who have used it as a forum to ask advice on fundraising, how to operate in a startup, or ask investigative questions about companies' origins. The seeming exclusivity of the site, where top bloggers, entrepreneurs, VCs and business people are interacting with the same people who enjoy their products has been extremely attractive - especially when they truthfully answer burning questions we've all had. More than a year ago, I said that any successful social site needed to nail three points, namely: Technology, Community and Relevancy. Quora has delivered on all three, rapidly tying people to relevant topics, connecting them with people from other networks or just within the site, and providing an intelligent platform that helps surface quality. The attention to quality is especially critical for Quora. The community's ability to edit questions or answers manages to keep discussion accurate, while logs are kept for each edit, so one can see if responses are being redirected. Answers can be voted up by the community, and it's clear who is doing the voting, providing another layer of authenticity to the service. Another big value for Quora is the return to long-form discussions. In a world of Twitter and Facebook, where discussions are measured in character counts, Quora's rich question and answers, complete with nested replies, seem much more fulfilling. Robert Scoble called this an ingredient of major blogging innovation, which helped kick off the spike in users, but even if it's not revolutionary, it's great to see more in depth discussion than abbreviations, hashtags and @replies. Where I have heard people express concern about Quora is what could happen if it breaks into the mainstream and becomes diluted as sites like Yahoo! Answers have, suffering from the chatroom phenomenon that doomed other sites targeted toward casual discussions. Safeguarding Quora from this is the use of one's real identity, connected through Facebook or Twitter, and the community's ability to downvote or mark as "Not Helpful" responses that don't pass muster. What I think is more risky than more people jumping into the fray is people simply declining to participate. The site is gaining huge value today from people candidly and transparently providing good answers to sometimes tough questions. If they choose to stop, putting a rein on the openness, the value can be lost, meandering into a world where users simply discuss products or trends. It may also simply be at the peak of its Hype Cycle, before falling into Gartner's famed Trough of Disillusionment. But this feels a lot more sticky than a fly-by-night idea. The site is becoming a valuable repository for insight into people and services, and each discussion smartly leads you to new people and new related topics, helping keep your interest level high. 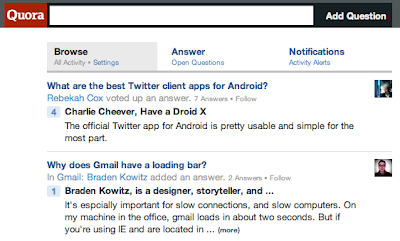 Without falling into the real-time sieve that can drown casual users of sites like Twitter and FriendFeed, Quora does maintain the feeling of newness. The site's front page shows notifications for activity on your network or previous history, and shows trending people and topics. If there's something going on in the site relevant to you, it has a good shot at finding your attention - without seeing items fall from the top in a never-ending waterfall. I've recently used Quora to discuss the popularity of Google Reader, why people still use FriendFeed, and why my6sense utilized implicit behavior to rank content. Many others are dropping interesting questions and receiving interesting answers. I am hoping the site does not become yet another place to count followers and connections, but the numbers are going up. You can find me on the site here: http://www.quora.com/Louis-Gray.